Frank Perdue was fanatical about chicken. He knew that the quality of his product would determine the quality of his business and believed that the secret to doing well was doing everything well. Perdue’s obsession with quality allowed his business to become a household name. His life was filled with lessons that would benefit companies today by showing that ensuring quality in every aspect of your business would provide customers with a quality experience that would win their lasting loyalty. The new book, “Tough Man, Tender Chicken: Business and Life Lessons from Frank Perdue” by Mitzi Perdue shares insight on Mr. Perdue’s passions directly from the copywriter for his ad campaigns, Ed McCabe. Smartblogs.com recently shared this enlightening excerpt. According to the book, Mr. Perdue’s passion extended to his advertising. Ed McCabe attributes the brand’s success to the man’s aggressive research of the advertising industry in order to affirm his marketing instincts. “I’m like that in everything, but once I make up my mind, you’ll find that I’m more reasonable,” explained Mr. Perdue. 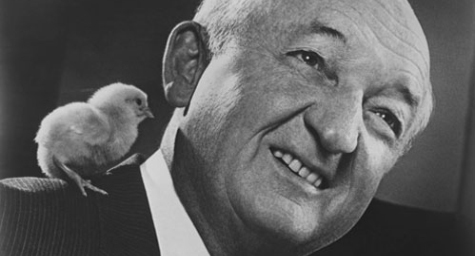 Ironically, that explanation was the inspiration for his greatest ad campaign with its tagline, “It takes a tough man to make a tender chicken.” The decision to make Mr. Perdue the star of the advertising campaign was to show American audiences the strength of his passion for quality. And it didn’t hurt that his thin build and squawky voice made him resemble the chickens he sold. The campaign was so successful that the agency worked for the brand for 20 years. The length of this relationship is rare in the advertising industry, but it proves that when quality is provided, there’s no reason to fly the coop. Discover winning strategies for successful branding and advertising. Contact MDG Advertising. MDG Advertising is a full-service advertising agency and one of Florida’s top branding firms. With offices in Boca Raton and New York City, MDG’s core capabilities include branding, logo design, print advertising, digital marketing, mobile marketing, email marketing, media planning and buying, radio and TV advertising, outdoor advertising, newspaper, video marketing, website design and development, content marketing, social media marketing, and SEO. To discover the latest trends in branding and advertising, contact MDG Advertising.